“Nigh-night, Mama. Nigh-night, Dada. Nigh-night, Pup. Nigh-night, Boo-Boo.” She runs through her list, unprompted, night-nighting her loved ones in the house. “Dit.” Yes, honey, Boo-Boo’s sick. “Boo-Boo. Tum-tum. Hurt.” She signs “hurt” with her index fingers, pointing them at each other like God passing the spark of life to Adam in the Sistine Chapel ceiling. That’s right, honey, Boo-Boo’s tum-tum hurt her. “Nigh-night, Boo-Boo.” That’s right, Boo-Boo went night-night. “Deep.” That’s right, Boo-Boo went to sleep. And Boo-Boo’s been asleep for a week and a half. 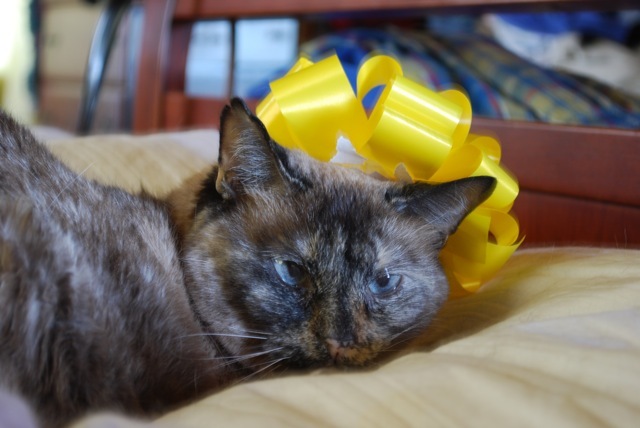 She came to us, a lost cat with a jingle-jingle collar, when we lived in Texas. A Manx-Siamese cat, she never took much comfort in the usual kitty things: no snuggling or lap warming for her. She’d bite you. She maybe purred a half a dozen times. Maybe. All the same, she was a gift. Our daughter certainly thought so. She’d go up to her, try to pet her, then quickly retract her hand, as if Boo-Boo were hot. Teeth are a good dissuader, but not good enough. She kept trying. She’d pick up the cat toy and wave it, trying to engage Boo-Boo, and sometimes it worked. When Boo-Boo came to the kitchen, hoping for some canned food and waiting patiently by the island, my daughter would say, “Eat!” and put her hand to her mouth to sign hungry so I’d know to feed Boo-Boo. In time, Boo-Boo would suffer enough to let my daughter pull her ears and lean against her like a pillow. 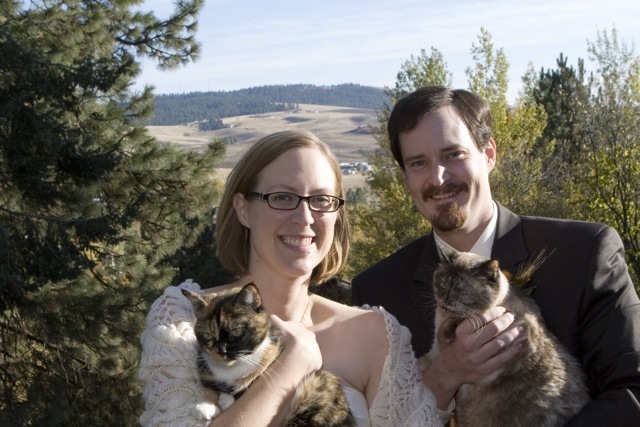 And she’d been part of the family for years, even appearing in a wedding photo with Sophie. With the addition of our daughter, our family has grown, and it was going to grow more. “You’re going to have a brother or sister,” we told her. “Right now, the baby’s inside Mama’s belly.” Give Mama’s belly a kiss, we prompted her. After the miscarriage, we didn’t tell her to do that anymore. About a week later, though, unprompted, she bent over while sitting in my lap and kissed my belly. She hasn’t done it unprompted before or since, and I wondered if she understood more than we thought she could. She was with us at the doctor’s office when they couldn’t find a heartbeat for the baby, protective and crying when they wanded me for an ultrasound, and she was with me when Boo-Boo had to be put to sleep; kidney disease is a silent, sneaky thing, drawing in even the toughest of cats, the ones you think that would even be likely to outlive you, even if you lived another fifty years. 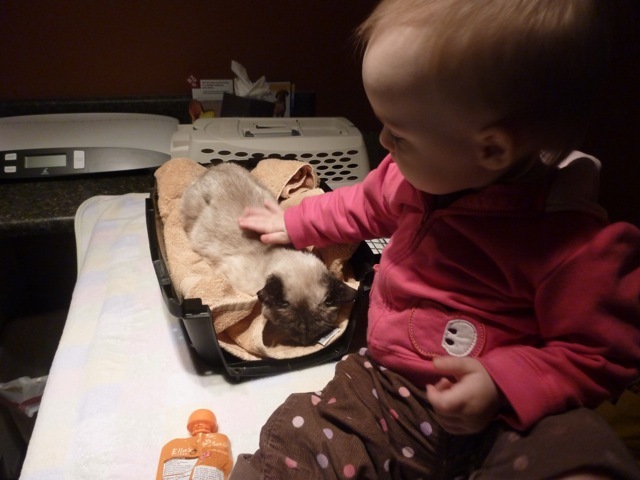 We sat in the room with Boo-Boo before the vet came in, and my daughter petted her, pulling her ears as she often does. The vet came in, and, protective and crying, she shouted, “No-no!” when the vet tried to pet Boo-Boo. What business did this stranger have with her cat? Once my lovely stroked the cat again, a vet tech watched her while I cried and spent time with the cat. I didn’t want her in the room while they gave Boo-Boo the shots that would end it all. Outside, I could hear her playing and talking to the parrot which lives in a cage in the corner. “Nigh-night,” she said with a little wave. “Deep,” she added. That’s right, honey, Boo-Boo went to sleep. And still, she talks of Boo-Boo. It’s been eleven days. “Dit. Boo-Boo.” Then she’ll raise a finger and wag it, shouting, “NO! NO! NO!” Is it to the vet? To Pepper, our other cat, who would chase Boo-Boo and leap on her, like a pro wrestler jumping off the ropes? Is it something more, her way of warding off something I didn’t know she could understand? What can a little girl know of death? Night-night, Boo-Boo, and night-night, little one.